Your sliding door rollers are the most important thing connecting your door to the track. They are often the first part of the door to go. 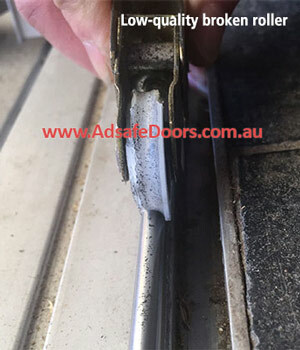 So we get a lot of sliding door roller repair jobs in the Sydney region, every week. In fact, your sliding door rollers are the key element that helps your door slide smoothly and effortlessly. If you’ve ever seen a door that rolls perfectly, it’s because of the high-quality door rollers they are using. Unfortunately, many tradespeople from the cheaper sliding door repair companies use the cheaper and lower quality door rollers. As a result, they break down very quickly. At Adsafe Doors, we are very particular about the type of door rollers that we use. We will discuss the type of door rollers that we use with you, so you know straightaway the type and quality of our door rollers. Many people don’t realise the number of parts that go into a door roller. Now, the door roller is often holding an extremely heavy door, and it’s holding that throughout pushing, slamming, jamming, kids coming in and out, and people kicking the door and so on. What we need to do is make sure the internal parts, the springs that are in there and the quality of the roller is very, very high. The lower the quality, the worse the performance, the faster it will disintegrate and break down. The higher quality the roller, the longer life you will get out of it, the less maintenance you’ll have to do and the higher quality your experience with opening and closing your door. Now, one thing that many people forget is the security and safety of your family. When it comes to door rollers, it is important for the locks to line up. The cheaper the quality roller with a heavy door means that the door could drop, and you are no longer able to lock the door. If you can lock the door, it might be putting so much pressure on it because it’s dropped, say five millimetres, and as a result, it’s putting pressure on the door locking mechanism. What we want to make sure is that the door lines up perfectly, and we use high-quality rollers, so your door can open and shut effortlessly. Over time, high-quality sliding door rollers will keep your door at the perfect level to line up your locks every single time. Our goal with you when it comes to sliding door rollers is to use the highest quality rollers, so we can give you a satisfaction guarantee. You know exactly what you’re getting. For those of you who are interested, we’ll actually talk you through the exact roller that we use, so you can see firsthand your old, cheaper quality roller versus the new high-quality roller. Give the team at Adsafe Doors a call today, and we’ll talk you through exactly what needs to happen to get your sliding door rollers refreshed, renewed and rolling like new again. You will be so pleased once your door is back to normal.